I can't wait...Mom and I are having a girls day today. We are gonna do a little craft shopping, out to lunch, and then to a movie (Harry Potter, 3D of course). I'm really looking forward to spending the day with my mom ♥. Lots of family time with Scott and Ethan planned this weekend too. Looking forward to a video of today's haul. Hope you get some fantastic deals!! I watched your Papertrey ink video and now look forward each month to their new Tag It's and Think Big stamps! I really enjoy your videos. Such a cute card! I have that collection and now am inspired to make something with it. Pretty card! Your day sounds PERFECT! Great card! I just love watching your videos! Awesome card. I love how you covered up the elements you didn't love and by doing thet gave the card extra texture. Brilliant!!! Very fun! My daughter & I are trying to slip out later to at least catch the Harry Potter movie. Enjoy your day with your mom. Have fun on your girls day out with your mom! Hope you get lots of great deals!! I love this cute and simple card! You always make everything look so easy with your great directions! Even a novice like me feels like I could do this! Wonderful way of covering up things you don't want shown! Very cute card (as always!)! Have fun shopping! Hi Christina, Just want you to know that I enjoy your posts and find them so informative. You are sooooo talented and a real inspiration! 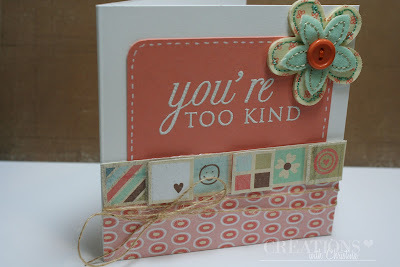 This card is so darn cute and you made it look so easy to do. Thanks!!! Have a wonderful day with your mom. Sounds fun! Love HP! Thanks for showing your card. I've been looking for some white embossing powder, so I'm glad that you used it on your card. Esoecially like the tip of putting the twine around the back of the piece of paper & the covering up of thigns you do not want to show with what you want to be seen. Ahh you make it all look so easy. Thanks again and again for all your ideas. Have a GREAT time on your Mother/Daughter Day!! So cute, I would have never thought to punch out other shapes to go over unwanted parts like that! TFS :) Hope you have fun shopping. Nice card! Enjoy your day, those days with your mom are special. I miss them. Have fun! I'm a day late in seeing this, but I love your idea of covering up the alphabet parts with other parts of the paper. That tip comes in handy for me to use on some paper I have with parts I don't want. Hope you and your mom had a great day. How lucky you are to have her in your life. love the card....sounds like fun going craft shoppin, lunch & a Movie...that sounds like super fun. Super cute card. Love your style of teaching too. I don't miss the music at the front or on the tail of the videos. Keep it simple is my motto. Thanks Christina for sharing your crafty talents. Sounds like the perfect day with you mom! And your card is so cute! Love it! Very cute card. Thank you for the tutorial.